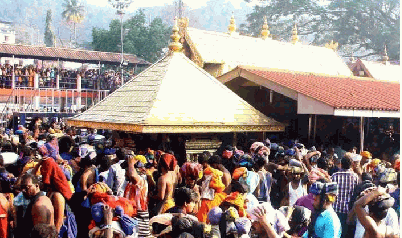 On multi-day of high show, two young ladies, a columnist and an extremist, were compelled to desert their endeavor to enter the Sabarimala sanctuary on Friday subsequent to dissenting lovers obstructed their way and the Tantri (boss cleric) undermined to bolt the ways to the sanctum sanctorum if the ladies were permitted to enter the place of worship. Pressure grasped Sabarimala around 7 a.m. whenever Kavitha, a TV journalist from Hyderabad, and Rehana Fatima from Kochi achieved Pampa to embrace the difficult trek to the ridge holy place. The ladies, wearing head protectors and fire coats and ensured by a unit of policemen, driven by Inspector-General of Police S. Sreejith, achieved Valiyanadappandal, scarcely a 10-minute leave the means prompting the sanctuary around 8.40 a.m.
Be that as it may, the gathering was not able to go any further as they experienced around 300 aficionados, including youngsters, who were blocking access to the street prompting Lower Tirumuttom. Pandalam Palace Managing Committee secretary P.N. Narayana Varma revealed to The Hindu that he had sent a correspondence through an exceptional delegate coordinating the Tantri to close the sanctum if any young lady damaged the sanctuary's traditions and entered its areas. Communicating anguish over the raising pressure, Tantri Kandararu Rajeevararu engaged lady enthusiasts in the age gathering of 10-50 to abstain from visiting the sanctum in the bigger enthusiasm of re-establishing peace. The clerics helping the Tantri and Melsanthi (head minister) too turned out in dissent, communicating solid hatred against the police escorting the two young ladies to the sanctuary. Droning mantras, they crouched close to the 18 stages prompting the place of worship. Reacting to the correspondence from the Pandalam Palace, the Tantri said he would need to close the sanctum for filtration (amends) ceremonies in case of any "contamination" of the sanctuary regions. The police at long last influenced the two ladies to forsake their outing and they were escorted back to Pampa under tight security by 12.50 p.m.